The Sound of the City! Doodle Art! 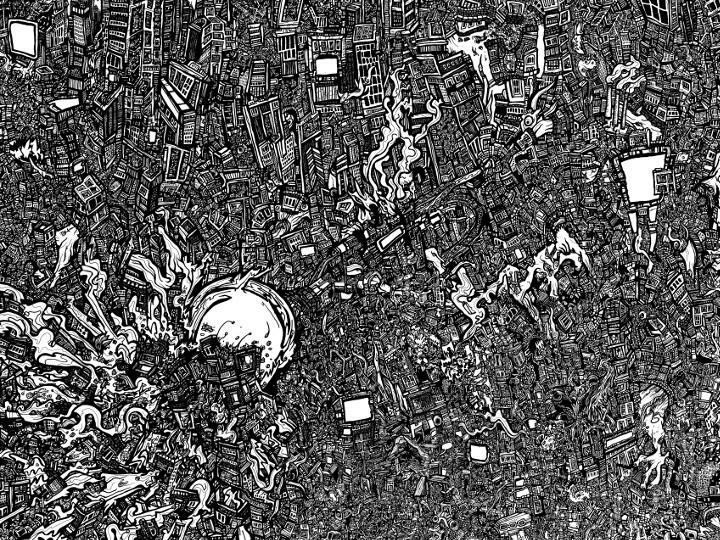 “The Sound of the City” is an extremely detailed freehand pen and ink drawing of the monstrous metropolis. The artwork depicts all noisy congestion and excitement of the big city. The various areas and activities collide and combine including the busy stomping of sidewalk shoppers, the blasting music and boasting bargains of the storefronts, honking horns and screeching tire traffic jams, the endless activities in apartments, alleyways, offices and skyscrapers. The entire ordeal is presented as an organic medley of shapes and experiences mixing together to reveal a magnificent form. Beneath and between all the buildings lies a secret monstrosity. The eyes and antennae of an enormous dragon can be seen peaking out from the bricks. The smoke stacks reveal the mythical beast’s giant claws and in these appendages we can see an enormous trumpet blasting out the sounds of the city with a mighty message. Despite all the chaos there is still the some sort of music holding everything together! The organically optical illusion depicting the dragon’s trumpet can be scene running diagonally through the image. On the original (larger) drawing it easier to pick out but online the best way is to view it is to start looking at the large white blast of music coming from the bell of the horn in lower left hand side and work your way up through the image. 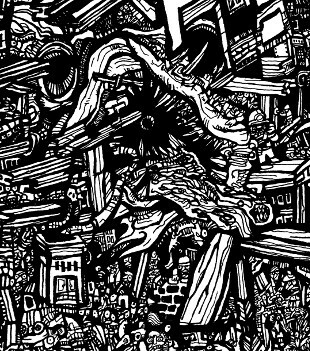 “The Sound of the City” is one of the most intricate and detailed images in the entire “HEY APATHY!” collection. The original 30” x 40” drawing pen and ink drawing took approximately 200 hour to complete. Like all of my works I just got inspired by a simple idea and started making the rest up as I went along. 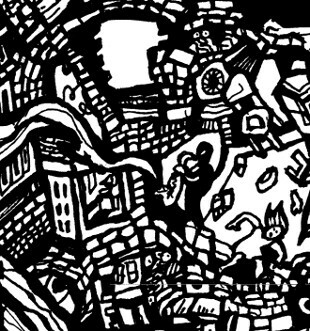 My initial thought was to do a doodle art drawing about all the places and things that make music in the city. I thought about people waking up to the radio, singing in their cars, and all the music in stores, bars, street corners and offices. Then I started considering all the noises around the metropolis as a symphony. The horns and squeaks became a brass section while the tires and train tracks took of the rhythms topped off by both human and electronic melodies. The very first thing I drew was a tiny little saxophone player and the doodles, like a train of thought, just kept growing from there. The hidden image of the giant trumpet was actually one of the last things that happened. I was about to draw an annoying neighbor playing the horn in one of the apartments when I had the epiphany of making the sound of city. 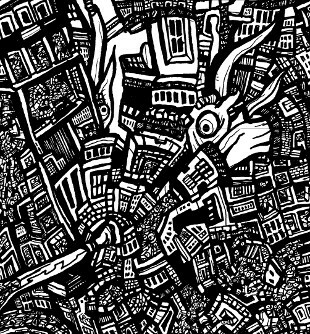 DOODLE ART Crazy Black and White Drawings of Surreal Cities turned Monster!